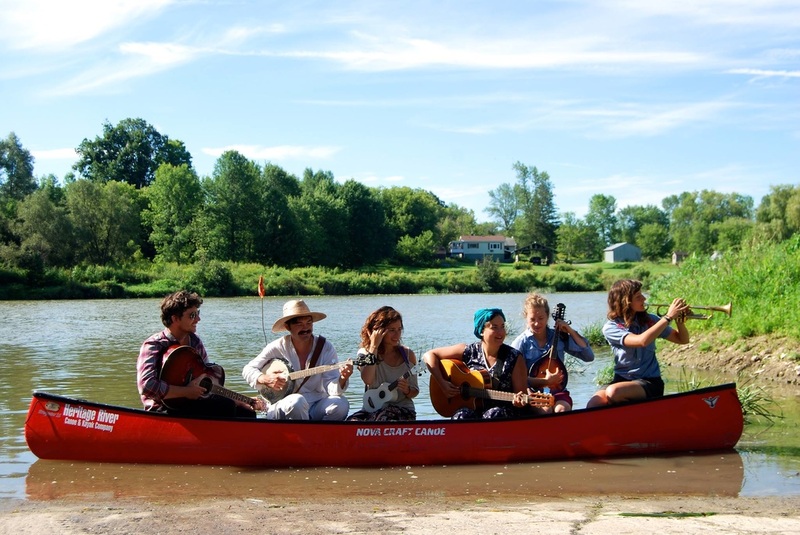 FISH QUILL CANOE TOUR 2015 - Ain't it Grand! Dana Sipos is a nomadic Canadian folkist who weaves myths, stories and dreams into song. She recently released her third album described by fRoots (UK) as "beautifully-crafted, darkly romantic folk-indie with real substance." 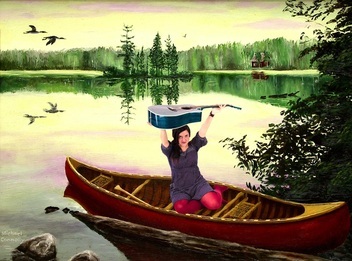 Abigail Lapell is a Canadian folk noir singer-songwriter. Drawing from traditional folk, indie and punk rock influences, her music is at once fresh and familiar - intuitive melodies, sparse-plucked guitar and a voice like autumn smoke. Alix Aylen is a self-taught trumpet player, having learned along the way on several bicycle trips through Canada, the US and Mexico. She is an avid long distance tourer, seeking out inspiration in the vastness of landscapes accessible only by human powered vehicles. Bobby Gadda is an interdisciplinary interactive performance artist, best known for building and riding a freaky tall bike across North America. He is a classically trained flautist as well as an un-classically trained banjo player. Mira Pinkus is a poet-musician who is known to sing poetry without words and write melodies in silence. Her poetry, often balancing the highly abstract with the immediate and sensuous, has appeared in Red Claw Press and Fringe. Liana Rose couldn't bring her piano on a canoe, so you might catch her with a ukelele, guitar or dulcimer. She'll sing her little heart out anytime, be it alongside friends in the redwood forests or alone under the stars in rolling desert sands.